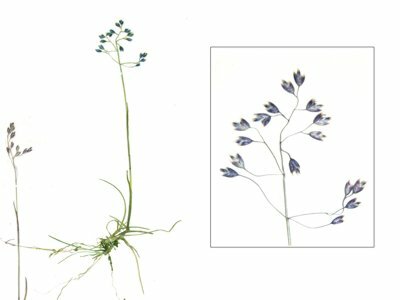 AgroAtlas - Relatives - Poa arctica R. Br. - Arctic bluegrass. Poa arctica R. Br. - Arctic bluegrass. Family Poaceae Barnhart., genus Poa L.
Poa debilis V. Vassil., Poa petshorica Roshev., Poa Williamsii Nash. Perennial grass of small size, cespitous with long rhizomes. Stems erect, glabrous, 10.0-25.0 (40.0) cm tall. Leaf blade soft, narrow (about 1.0-2.0 mm), folded or flat. Ligules 1.0-1.5 mm long. Panicle-like inflorescence, spreading, 3.0-10.0 cm long with thin, glabrous branches. Spikelets 4.0-5.0 mm long, dark in color. Lemma is hairypubescent along and between ribs. Anthers are 1.4-2.5 mm long. Blossoms in June; seeds ripen in August. Facultative cross-pollinated by wind. Viviparous forms are rather rare. 2n = 42, 56, 60, 62, 70, 74. Distributed throughout the Arctic, Northern European and Western Siberian parts of Russia, Eastern Siberia, and the Far East. Adapted to arctic and boreal conditions. Occurs in different tundra, in the forest zone, along seashores and riversides, and on stony slopes close to water. Forage grass of natural tundra pastures. Good palatability for deer, sheep, goats and horses. Good re-growth after 2-4 grazings. Can be used as a lawn grass. Brezhnev D.D., Korovina O.N. 1980. Wild relatives of the cultivated plants of flora of the USSR. L.: Kolos, 376 pp. (in Russian). Fedorov A.A., ed. 1974. Flora of the European part of the USSR. Vol. 1. L.: Nauka, 404 pp. (in Russian). Harkevich S.S., ed. 1985. Vascular Plants of Soviet Far East. Vol. 1. St. Petersburg: Nauka, 390 p. (in Russian). Hulten E., Fries M. 1986. Atlas of Northern European vascular plants north of the Tropic of Cancer. Vol. 1-3. Konigstein, 1172 p.
Malyshev L.I., Peshkova G.A., eds. 1990. Flora of Siberia. Vol. 2. Novosibirsk: Nauka, 361 pp. (in Russian). Malyshev L.I., Peshkova G.A., eds. 1979. Flora of Central Siberia. Vol. 1. Novosibirsk: Nauka, 536 pp. (in Russian). Rodjevitz P.U., Schischkin V.K., eds. 1937. Flora of the USSR. Vol. 2. M.-L.: USSR, 778 pp. (in Russian). Tolmachev A.I., ed. 1964. Arctic flora of the USSR. Vol. 2. M.-L.: Nauka, 273 p. (in Russian). Tzvelev N.N. 1976. Poaceae USSR. L.: Nauka, 788 pp. (in Russian). Copyright on the photos belongs to N.I. Dzyubenko.